One of the ever increasing most popular digital video camera security systems is the IP cameras security surveillance. This camera system is unique in that it utilizes the internet as a medium for sending video images and remotely controlling the camera making accessibility nearly ubiquitous throughout the world. There are a few variations on the theme on how these cameras and/or camera security systems operate, but the end product is the same. A digital video file that can be viewed virtually anywhere there is broadband internet access and stored on a personal computer’s hard drive for later use or archiving. Let’s take a quick look at an average standalone digital video security camera system and how it works so we can better understand how IP cameras security surveillance systems work. A standalone system is so named because it can be used by itself without any additional outside equipment (i.e. other than the standard system equipment, no additional PC or other device for example is required). A typical standalone digital video security system contains one or more digital video cameras, a Digital Video Recorder or DVR with a Digital Signal Processor or DSP, and a monitor. The digital video cameras in these systems capture light images and transform them into electronic video images. The camera normally contains an analog-to-digital processor chip that sends the video image data in binary or digital form to the DVR unit. The DVR unit consists of three primary types of devices; the Hard Disk Drive (HDD), the DSP previously mentioned, and any additional peripheral type devices such as CD or DVD recorders to make portable copies of video files. The digital signal comes from the camera via an RG-59 coaxial video transmission cable to the DVR unit. Each individual camera must have its own cable run from the camera to the DVR unit. When the data reached the DVR unit the DSP processes the data, applies a COmpression/DECompression utility (or CODEC) that greatly compacts the information and reduces the final size of the digital video file. The digital video files is then viewed on a monitor (live) and/or saved to the HDD for later use. IP cameras security surveillance systems differ in that they normally connect to the Internet instead of using a video transmission cable to relay the camera data to the DVR unit. Furthermore, IP (which stands for Internet Protocol ready) cameras do this normally by one of two methods; either the data is sent via a Cat 5 Ethernet cable to a router or modem or wirelessly to a wireless router or wireless modem. Using the internet, especially the wireless technology, creates a great advantage for this system. Once the signal make it to an Internet connection the cameras can be viewed and/or controlled from anywhere in the world that broadband internet is accessible. This includes working in tandem with devices such as a Personal Computer or Mac Computer, iPhones, iPads and the like, and many 3G and 4G smartphones. Literally, you can see what is going on at home in Miami when you are on business travel in Paris. Another advantage of the IP cameras security surveillance system is the ability to use wireless internet technology. This eliminates the need to run the RG-59 coaxial cable from each camera to the DVR unit, greatly reducing installation time and making the process a do-it-yourself project that is a snap. IP cameras used for security surveillance are able to work by processing the video signal on board and sending it via the camera’s on board web server technology. A variation on this theme is the IP DVR. In this instance the standard cameras are used in conjunction with the DVR but the DVR has the IP capability and is connected to a router or modem. The files are stored on the DVR units HDD but are accessible via the internet to the user. On the receiving end of an IP camera security surveillance system that uses a personal computer the digital video files are stored on the computer’s HDD and viewed on the computer’s monitor. Normally this systems work in tandem with common internet browsers such as Internet Explorer, Safari, etc. Installation setup normally consists of a self installing software CD so for many systems no prior computer networking knowledge is needed. 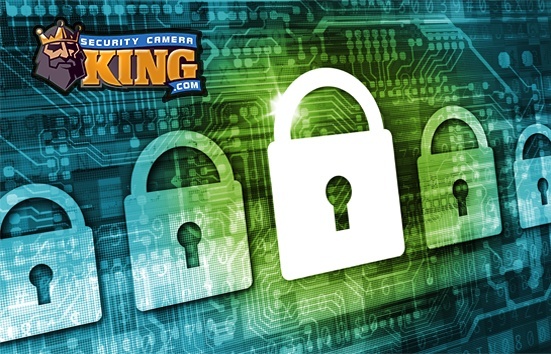 Security Camera King has a full line of digital video security systems. Contact one of our experts today if you are interested in purchasing an IP cameras security surveillance system.